Fishing Report - Stuart-Nechako Area - Welcome to NIHO Land & Cattle Company Ltd. The Stuart-Nechako area is one of the best kept secrets for fishing destinations in British Columbia. Those in the know head to the nearby lakes and rivers that are tucked along the scenic country roads to test their skill against the many game fish in the area. While there are not many “official” guides in this area, many locals are happy to give you the benefit of their experience. You can explore this area to find your own secret spot. NIHO spoke with experts in the area to give you a head start. Stuart Lake is considered one of the best fishing lakes in British Columbia due to its feisty fish population and the number of good fishing spots found throughout the lake. Rainbow and lake trout are prevalent in these waters. They normally range between 10-12 lbs, although trophy fish up to 25 lbs can be caught here. Jan from Big Red Z Charters says, “Most people don’t think of trout as a game fish, but they can be even feistier than a salmon on a good day.” He says he’s never come home empty handed from a day of fishing on Stuart Lake. Other fish to be found in these waters include Kokanne, Whitefish and White Sturgeon. The fishing season does not stop when Stuart Lake freezes over. Vincent from NUYIZ Boat Tours notes that ling cod is plentiful for ice fishermen. He suggests fishing northern Stuart Lake, especially around Honeymoon and Battleship Islands. However, Jan says that there really are no bad places to fish at Stuart Lake. He has seen 5 lb trout landed on the dock. If you are planning on boating on Stuart Lake, bring the large boat or plan to rent one. All of our contacts strongly discourage small car-top boats on Stuart Lake due to sudden changes in weather. Stuart Lake is part of a chain of lakes in this area. Trembleur Lake hosts Rainbow and Lake trout in the 10 lb range, although the largest rainbow caught here was over 22 lbs. The best times to fish here are from July to September. Takla Lake, one of the largest natural lakes in British Columbia is known for its rainbow, lake trout, ling cod and white fish. Jan describes it as “true wilderness”, so come prepared for anything. There is a road linking Takla Lake with Fort St James. 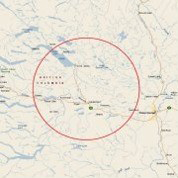 Vanderhoof is the gateway to the Lake District of northern BC between Vanderhoof and Hazelton. There are literally hundreds of lakes in this area, and some of the most productive ones are the smaller lakes which dot the landscape. The best known lake in this area is Nulki Lake. Len at Omineca Sports in Vanderhoof told us that this is the best lake in the area for trolling. Look for rainbow trout and burbot. Nearby Tachick Lake has some nice size rainbow trout (up to eight pounds) and pygmy whitefish. Just east of Vanderhoof are Cluculz and Bedensti Lakes. Len notes that Cluculz in particular is known for its rainbows and large lake trout. He reports rumors of 40lb lake trout caught there recently. Bednesti hosts an abundant population of Kokanne, rainbow trout and lake trout. If you are looking for fly fishing action, Cobb Lake provides Eastern brook trout. Local expert Colin Barnard commented that fishing in this area is great year-round. He advises that spring is better for catching char, while September is great for rainbow trout. Further south is the Finger and Tatuk Lake. Finger Lake can only be accessed through the local resort. Once on the lake, you’ll find rainbow, Dolly Varden and Kokanne. The trout in Tatuk Lake can range between 2 and 11 pounds. The Nechako River is great for sports fishing. Colin suggests bringing your float tube and waders to get close to the action. The Nechako is a catch and release river only, and barbless hooks must be used. However, trout and Dolly Varden are plentiful here. Keep an eye on your line. Sockeye salmon are also found in this river; however, it is not permitted to catch them. Fraser Lake is well known for its fishing opportunities. Len told us that rainbow and lake trout are plentiful in this lake. Lake trout can range up to 12 lbs, with rainbow over 2 lbs being common. Take a larger boat to access some of the best areas of the lake. Colin recommends the Kenny Dam reservoir (also known as Knewstubb Lake) as one of the best places to fish in the area. Lots of large fish, including rainbow trout and lake trout, tempt fishermen to stay in the area. There are also several access points for boats. The road to this area are active logging roads, so use caution. Once there, campsites and local lodges provide a comfortable base for a long stay. The Nechako River flows into Kenny Dam, and fly fishing is popular from Fort Fraser through to Cheslatta Falls (especially at Cutoff Creek). However, the big attraction to fishermen in this area is the Stellako River, linking Fraser and Francois Lake. Fishermen from all over the world come here to catch and release the feisty rainbow trout. This is an important spawning river for Sockeye salmon but they are protected year-round. The reports we have received about the Stellako River is that fishing is excellent all season long, but best in June and July. In the fall, especially during salmon spawning season, keep an eye out for local wildlife, especially for grizzly bears. While we’ve discussed some of the more popular lakes, there are hundreds more waiting for you in this area. Len enthuses that “there’s lots of lakes to explore and lots of lakes to try.” Come to the Stuart-Nechako area, one of the best kept secrets in British Columbia.